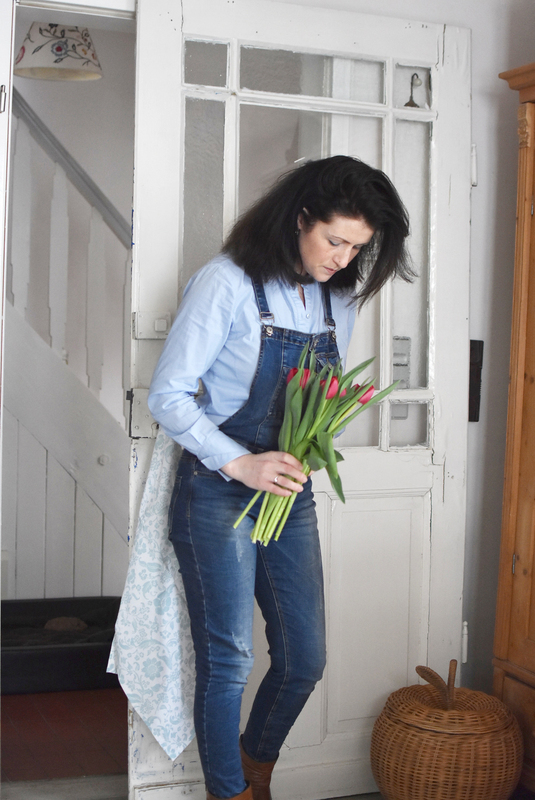 The lovely Fionnuala from Three Sons Later is here to show us how she has transformed her beautiful authentic country kitchen and updated it with a few accessories. When we moved into our house, the kitchen was the room we put the most thought and planning into. We agreed on a style, on fronts for cupboards, on a freestanding larder and a floor that would tie it all together. Now it was time to think of accessories. Our kitchen is white with solid wood worktops and two large windows, so it lends itself well to all sorts of colour schemes. At first, we went for red accessories, inspired by a red chair we have at the table. Over the years, as our three sons have grown, we have adapted the kitchen to our family needs. That has involved installing a bookcase, additional shelving and chalkboard. We don’t home-school, but to encourage the children’s development, we have an alphabet chart, maps, and nature charts on the kitchen walls. 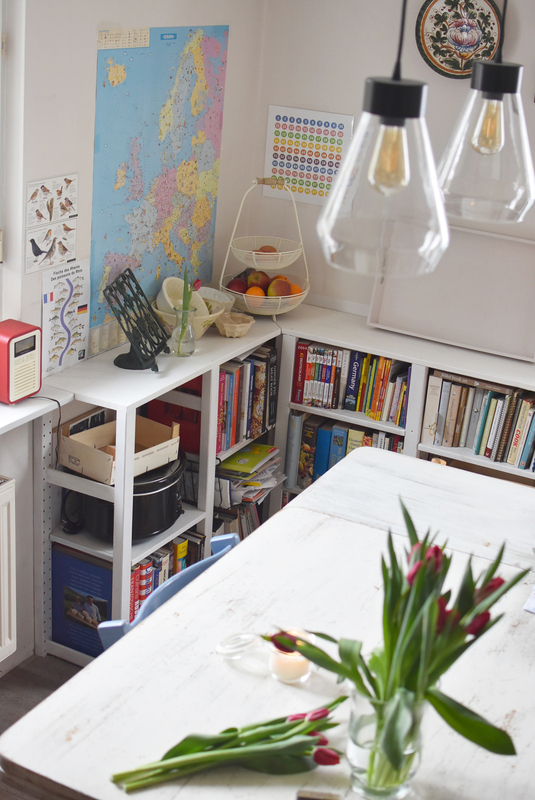 The result is anything from busy to colourful to eclectic, depending on the day. 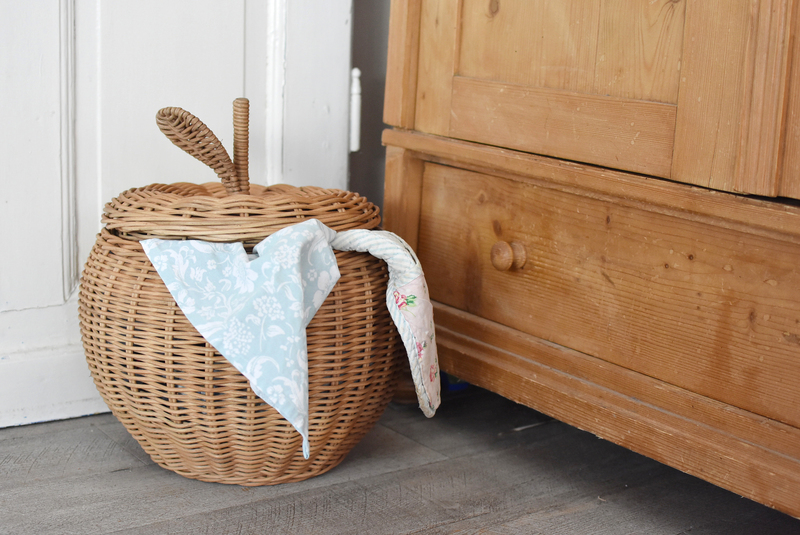 In a bid to regain a style for our kitchen, the real heart of our home, we recently teamed up with Laura Ashley and gave the kitchen a mini makeover. With a few simple steps, we have taken what was disorganised, mismatched and makeshift and made the room tidier and airier. The overall look is a lot better now. Step one was to assess what bothered us about the kitchen. Even when the kitchen was spotlessly clean, it didn’t seem tidy or organised. The worktops were full. It felt like there was wasn’t enough space for everything, even though there should be. The serene, pristine white kitchen of our first few months in the house had gotten lost and needed bringing back. But how? Step two was to decide on the changes we needed to make. Reducing clutter and toning down the colour were the two main changes that needed to happen. As well as that I wanted to strive for the motto “a place for everything and everything in its place”. That might come across as very housewifey – especially from someone who isn’t a housewife at all. However, with three young sons, a lively Labrador and a husband who tends to mislay things, it was the right path for us to follow. 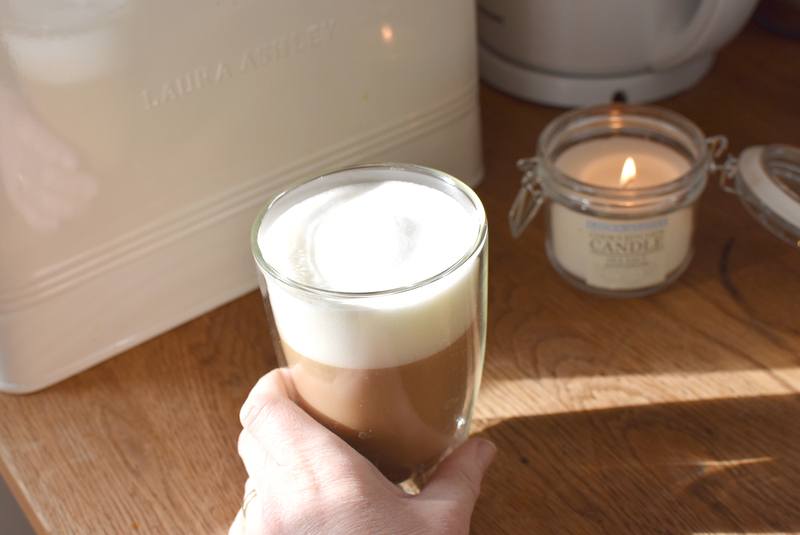 Step three was my favourite one – choosing a few new items to transform our kitchen. Looking at the new range of Laura Ashley interiors it was obvious to us that tying in with the white and wood in the kitchen would best help us achieve the look we were striving for. 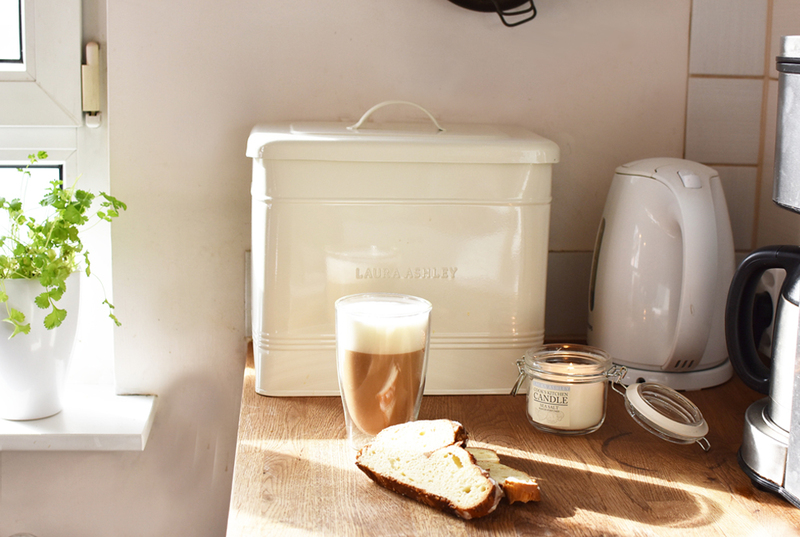 The large, lidded bread bin really tidies up the worktop and is so much nicer to look at than half a loaf of bread in its packaging. As I love to bake, it makes an ideal space to keep cake, bread or other goodies out of harm’s way. Our old chrome and blue fruit bowl served us well for twenty years. Unfortunately, it didn’t add anything to the kitchen’s appearance. Plus it was just too small for fruit for a family of five. 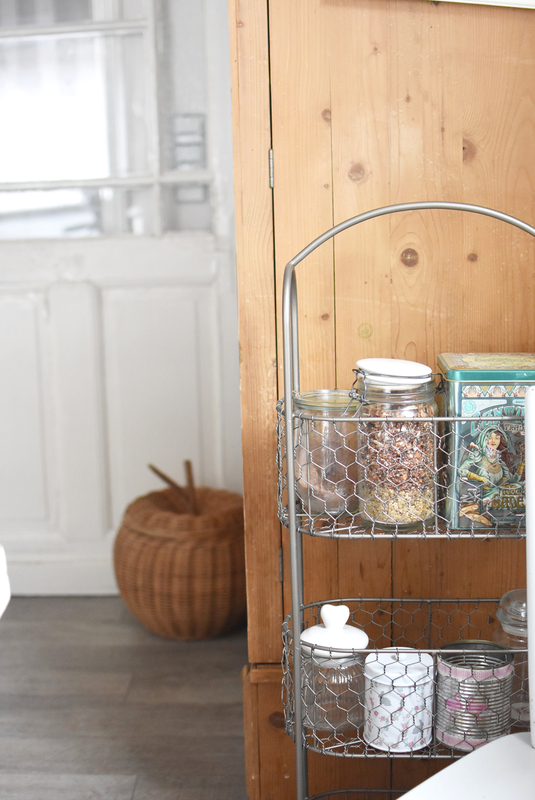 The two-tier fruit basket in cream with a wooden handle suits much better with more than double the storage while having the same footprint as our old one. Over by the hob, we had two metal containers for storing wooden spoons and various utensils. 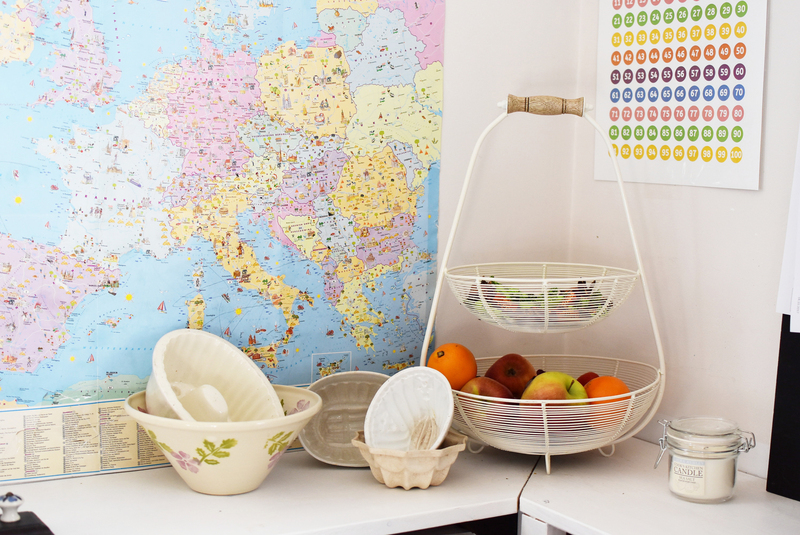 Replacing these with one larger container in cream leaves us with some much-appreciated extra space. The glossy exterior is so easy to clean compared to the caddies we had till now. Speaking of creativity, I couldn’t resist the apple wicker basket. It is the perfect match for the freestanding larder by the kitchen door and now houses aprons and spare oven gloves. Previously the aprons had been hanging on a hook by the door but always looked a bit shabby. You can’t see them now but they are within easy reach. Even our three year old can get at his apron by himself without having to push a chair around the kitchen to climb up on. Lastly, we chose a three-tiered metal shelf and have placed in the unused space at the side of the larder. We filled it with tins, jars and vases that were taking up too much space on the worktop. It pretties up that corner and, again, leaves everything easily accessible to the children and us. The overall effect, now that we have added in some creative storage solutions, is a much calmer and cleaner look. When clean and tidy, the kitchen actually looks nice. That, in turn, makes us more inclined to keep the place orderly. Adding in more white and removing items that clashed has made the room seem brighter too. Even on a dull winters morning, that we are still having. 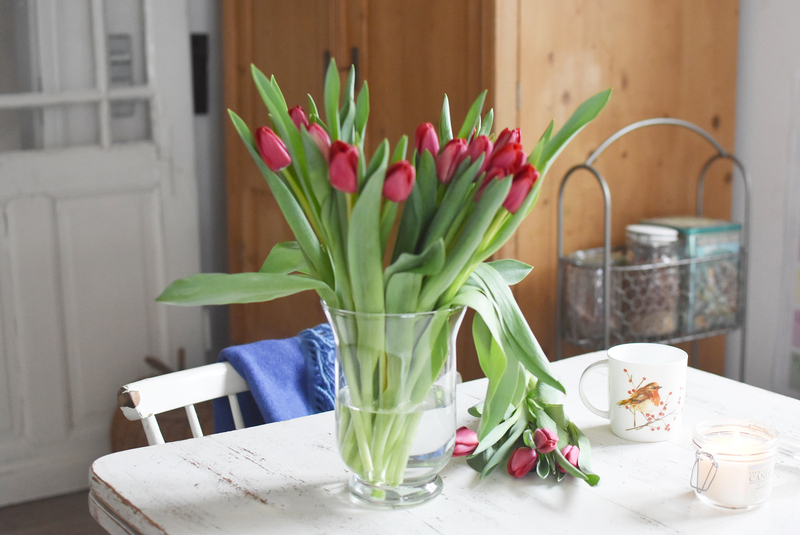 For a splash of colour, I can always pop a bunch of flowers in a vase. I can’t wait to see how good it all looks in the spring sunshine. 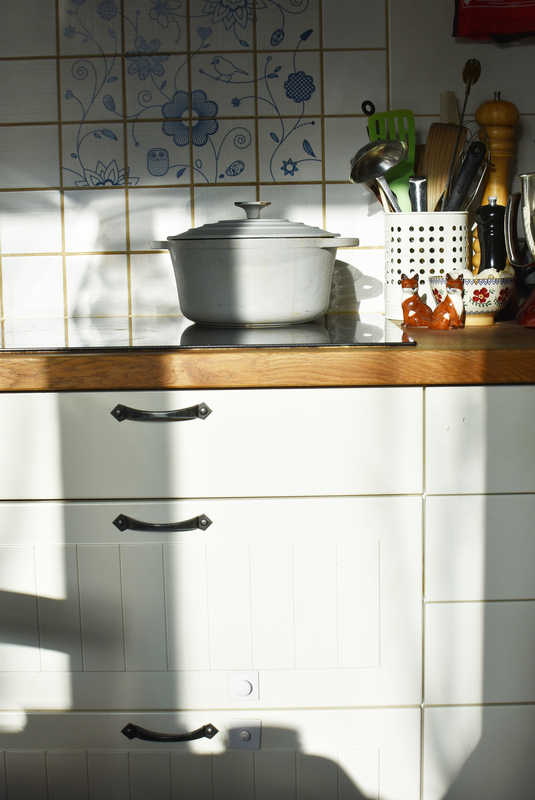 Have you recently given your kitchen a makeover? Let us know below or @LauraAshleyUK.